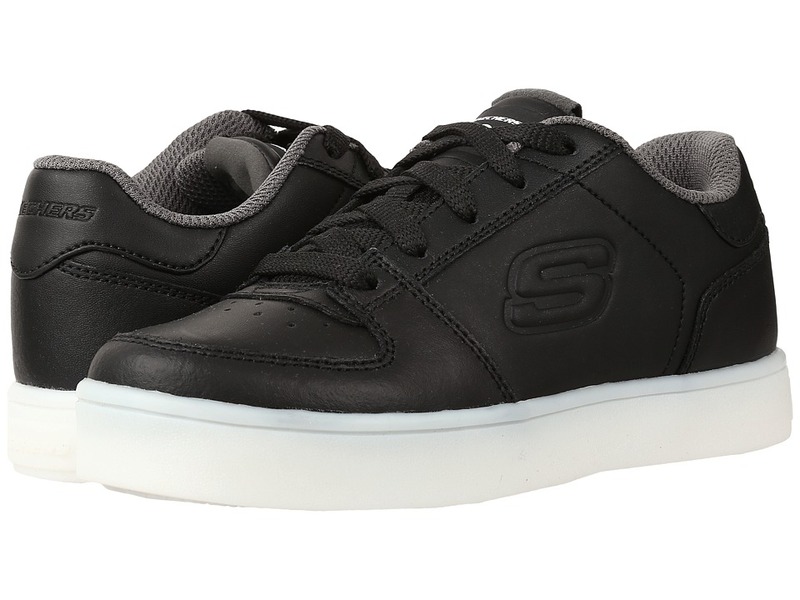 Change things up with the Street Lightz 90481L Lights from SKECHERS KIDS! Leather upper with synthetic overlays. Elastic laces with hook-and-loop strap for an adjustable fit. Padded collar and tongue. Lightly cushioned footbed. Translucent rubber shock absorbing midsole. Flexible rubber traction outsole. 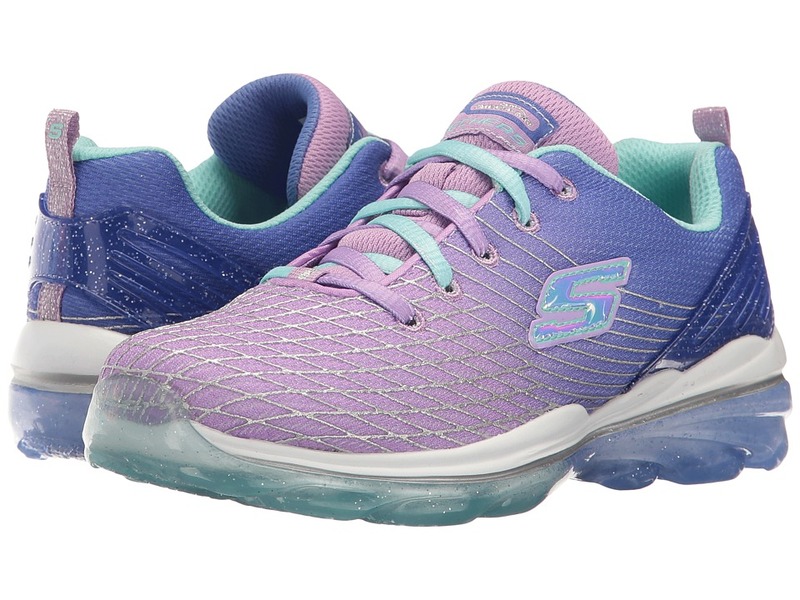 When she has the extra pep in her step, give her more flight with the bounce of the SKECHERS KIDS Skech Air Jump Around 80126L. Air cushioned Skech-Air outsole with translucent air pocket cushion design which adds more bounce to every step. Gel-infused Memory Foam ultra-soft insole. Shock absorbing supportive midsole. Flex groove midsole offers support and flexibility. Rubber outsole delivers traction. Imported. Light up some fun in the Lighted Gore Strap 90293L Lights from SKECHERS Kids! Lights up with every step! Breathable mesh upper with synthetic overlays. Mesh fabric panels for cooling effect. Elastic laces and hook-and-loop strap for easy on and off. Easy on and off button at strap for easy control of light-up feature. Heel pull-loop for easy entry. Padded collar and tongue. Lightly cushioned footbed. Translucent rubber shock absorbing midsole. Flexible rubber traction outsole. Imported. Measurements: Weight: 7 oz Product measurements were taken using size 2 Little Kid, width M. Please note that measurements may vary by size. Weight of footwear is based on a single item, not a pair. 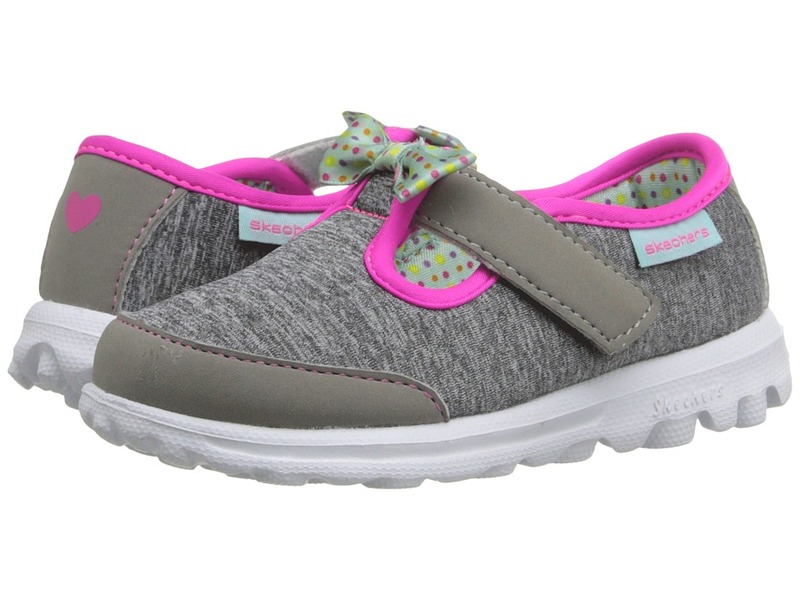 So exquisitely cute in the Go Walk - Bitty Bow from SKECHERS KIDS! Soft canvas upper features a soft dainty bow. Stitched and overlay accents. T-strap with hook-and-loop upper for easy on and off. Memory Form Fit lining for a perfect fit. Cushioned comfort insole for optimal environment. Shock absorbing super lightweight supportive midsole with color accent. Built-in 1/2 inch heel. Durable flexible outsole with circular sensor-inspired design. Imported. Measurements: Weight: 3 oz Product measurements were taken using size 8 Toddler, width M. Please note that measurements may vary by size. Weight of footwear is based on a single item, not a pair. 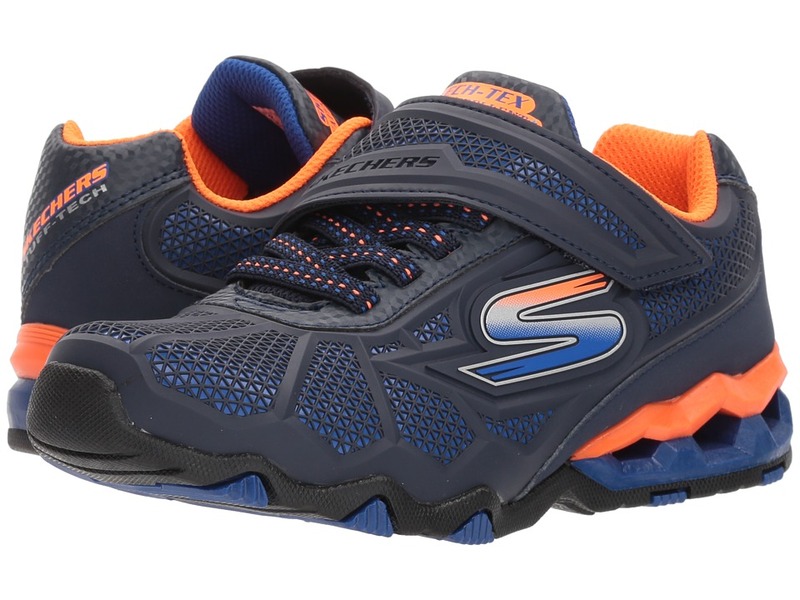 Ultra-cool and ultra-comfy in the Skech Air Ultra 80036L from SKECHERS KIDS! Smooth and textured trubuck upper with leather details. Ombre effect on sides and heel. Hook-and-loop closure for easy on and off. Soft fabric lining for great in-shoe feel. Gel Infused Memory Foam cushioned comfort insole. Shock absorbing lightweight midsole. Double layer Skech-Air sole design. Air cushioned pod outsole for bouncing comfort effect. Imported. Weight of footwear is based on a single item, not a pair. 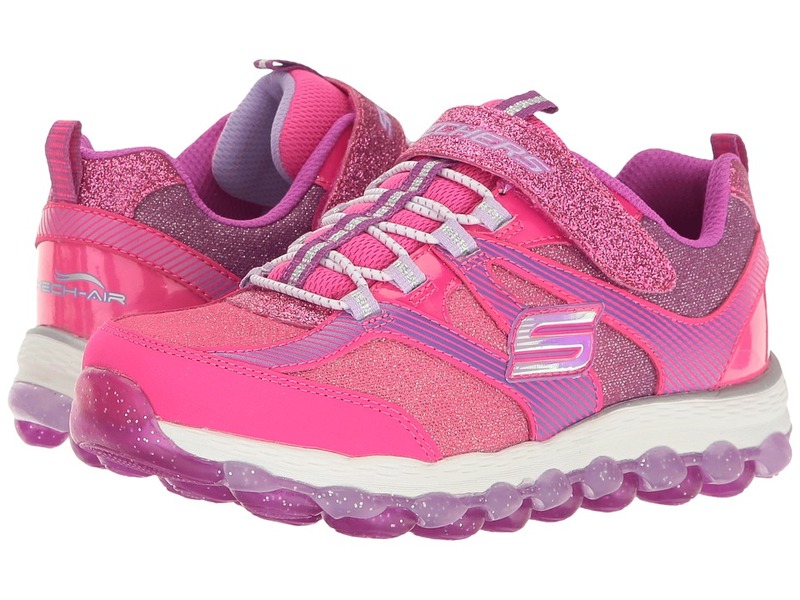 Keep their feet relaxed and comfortable in the Breathe - Easy from SKECHERS KIDS! Smooth leather upper. Micro-perforations at sides for breathability. Bungee lacing for quick adjustments. Hook-and-loop closure for easy on and off. Pull-loop at tongue for easy on. Foam padded collar and tongue for added comfort. Breathable mesh lining keeps feet comfy. Relaxed Fit design for a roomy comfortable fit. Memory Foam footbed creates a a comfortable environment for the foot. Shock absorbing low profile midsole. Flexible rubber nonmarking traction outsole. Imported. Measurements: Weight: 6.2 oz Product measurements were taken using size 13 Little Kid, width M. Please note that measurements may vary by size. Weight of footwear is based on a single item, not a pair. 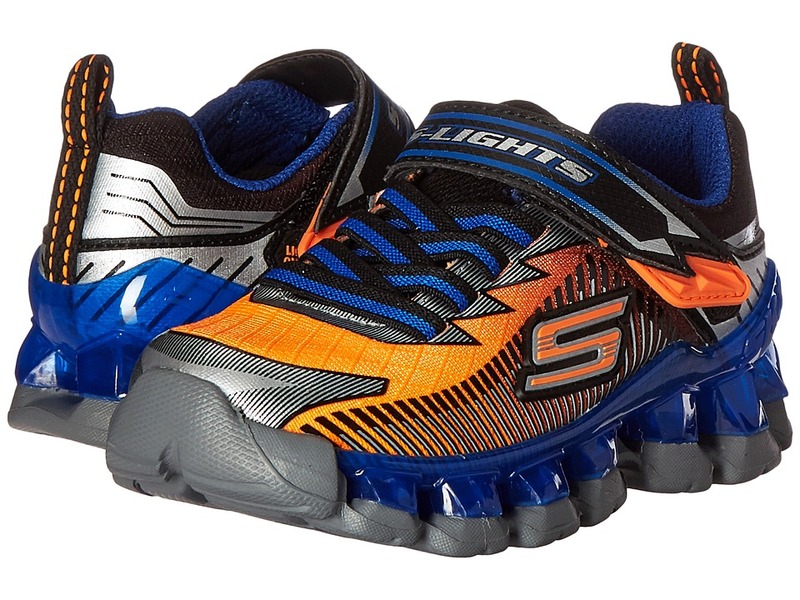 Mesmerize and surprise in the Hypno - Flash 90580L Lights from SKECHERS KIDS! Lights up with every step! Sneakers in a smooth trubuck leather upper. 3D printed synthetic overlays. Zigzag strap for easy wear and best fit. Heel pull loop for easy pull-on. Padded collar and tongue for optimal comfort. Cushioned comfort insole wrapped in soft fabric lining. Layered shock absorbing midsole. Flexible traction outsole. Imported. Measurements: Weight: 7 oz Product measurements were taken using size 2 Little Kid, width M. Please note that measurements may vary by size. Weight of footwear is based on a single item, not a pair. The lights to match their bursts of energy in their favorite SKECHERS KIDS sneakers! Sneakers in a smooth leather upper. Features rechargeable battery with dual-charging USB cable. Start button at tongue for multi color and sequence changing fun. Textured toe bumper front. Lace-up closure for snug fit. Padded collar and tongue for optimal comfort. Colors change with each press. Smooth fabric lining with cushioned comfort insole. Shock absorbing midsole. Imported. Measurements: Weight: 12 oz Product measurements were taken using size 2 Little Kid, width M. Please note that measurements may vary by size. Weight of footwear is based on a single item, not a pair. Anything but still in the Hydro - Static 97431L from SKECHERS KIDS! 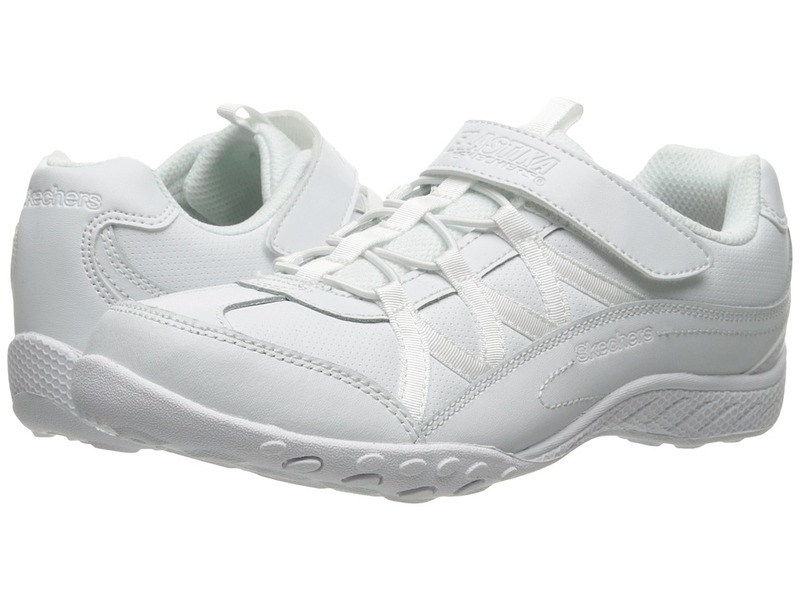 Sneakers in a synthetic sculpted upper. Flexible grid and support beam design for added support. Hook-and-loop closure for easy on and off. Padded collar and tongue for added comfort. Soft fabric lining with cushioned comfort insole. Open heel shock absorbing midsole. Rugged durable design resists damage. Imported. Measurements: Weight: 12 oz Product measurements were taken using size 4 Big Kid, width M. Please note that measurements may vary by size. Weight of footwear is based on a single item, not a pair. 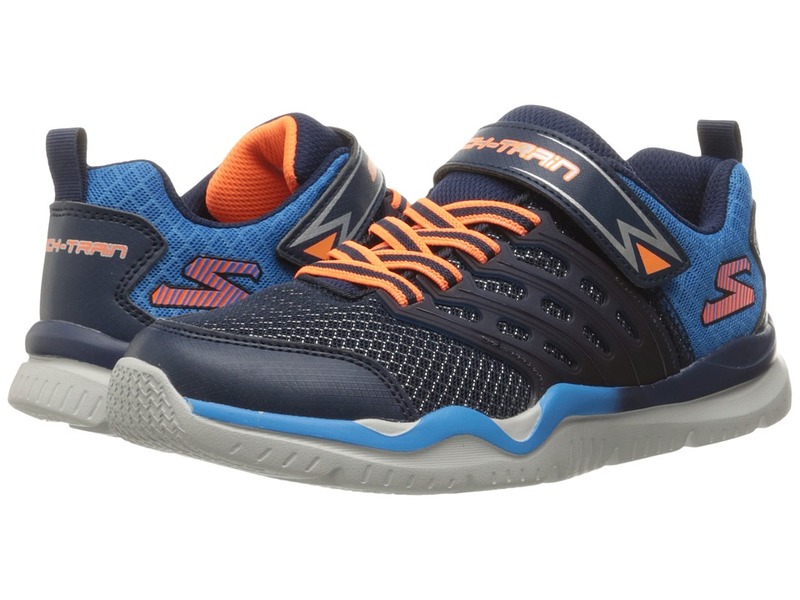 Bounce and run all day in the comfort of the Skech Air Deluxe 81195L from SKECHERS KIDS! Sneaker in a mesh nearly one piece upper features 3D printed synthetic overlay. Stretch Fit design features stretchable socklike collar and interior for optimal fit and comfort. Lace-up closure for snug fit. Padded collar and tongue for optimal comfort. Soft fabric shoe lining. Air Cooled Memory Foam cushioned comfort insole wrapped in soft fabric shoe lining. Shock absorbing supportive lightweight midsole. Flex groove midsole designed to provide support and flexibility. Durable flexible rubber traction outsole. Translucent rubber outsole features glitter infused detailing. 3/4 inch built-in heel. Imported. Weight of footwear is based on a single item, not a pair. 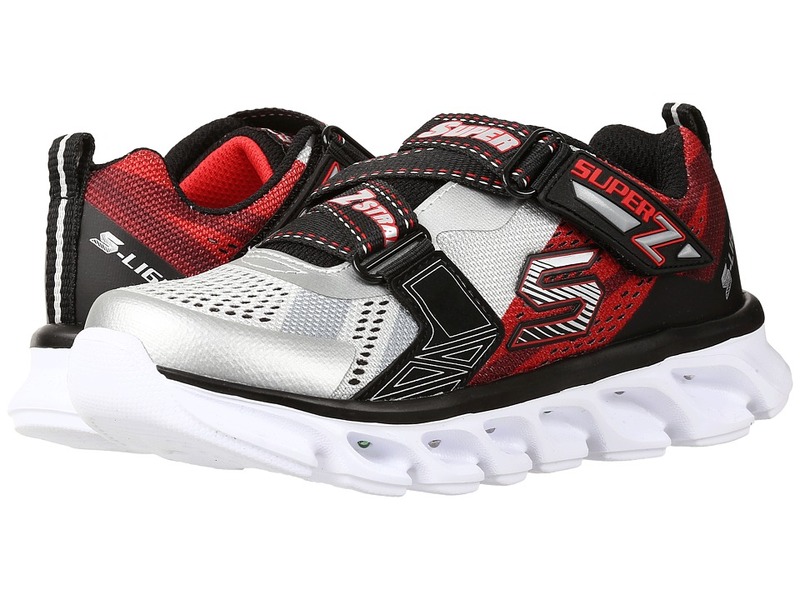 Hit the ground running in the Skech Train 97530L from SKECHERS KIDS! Sneakers in a synthetic sculpted upper with mesh fabric panels for cooling effect. 3D printed lightweight sculpted side panel overlays for lightweight stability. Hook-and-loop closure for easy on and off. Padded collar and tongue for added comfort. Soft fabric lining with Gel Infused Memory Foam cushioned comfort insole. Shock absorbing midsole. Flexible rubber traction outsole. Imported. Measurements: Weight: 6 oz Product measurements were taken using size 4 Big Kid, width M. Please note that measurements may vary by size. Weight of footwear is based on a single item, not a pair. 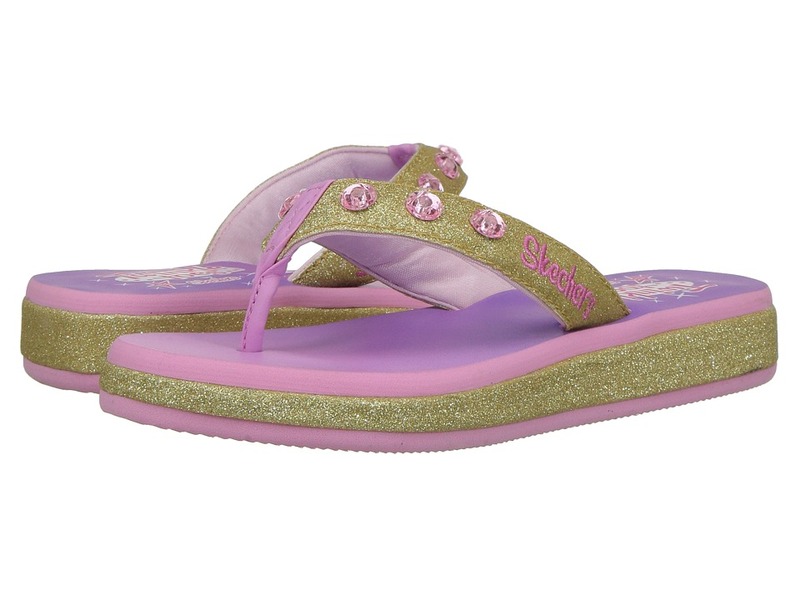 Bring way cool style to their kit on those warm weather days with the SKECHERS Kids Twinkle Toes - Sunshine Lights sandal! Flip-flop light up casual thong sandal design. Soft fabric upper with glitter finish. Stitching accents. Pretty round gem accents on upper light up with every step. Soft fabric toe post. Soft fabric strap lining. Cushioned footbed. Ombre color footbed with Twinkle Toes logo. Glitter finish midsole side panels. Shock absorbing midsole. Flexible traction outsole for durable wear. Measurements: Heel Height: 1 in Weight: 3 oz Product measurements were taken using size 2 Little Kid, width M. Please note that measurements may vary by size. Weight of footwear is based on a single item, not a pair. 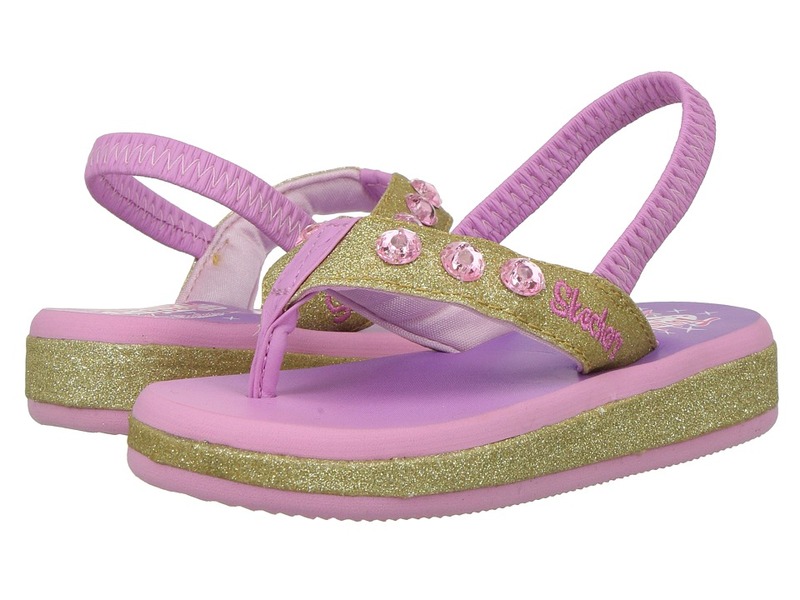 Give her some way cool style for the warm weather days with the SKECHERS KIDS Twinkle Toes Sunshines sandal! Note: Infant and Toddler sizes feature an elastic soft heel strap for stay-put fit. Soft fabric upper with glitter finish. Flip-flop light up casual thong sandal design. Stitching accents. Pretty round gem accents on upper light up with every step. SKECHERS embroidered side logo. Soft fabric toe post. Soft fabric strap lining. Cushioned footbed. Ombre color footbed with Twinkle Toes logo. Glitter finish midsole side panels. Shock absorbing midsole. Flexible traction outsole for durable wear. Imported. Measurements: Heel Height: 1 in Weight: 2 oz Product measurements were taken using size 9 Toddler, width M. Please note that measurements may vary by size. Weight of footwear is based on a single item, not a pair. 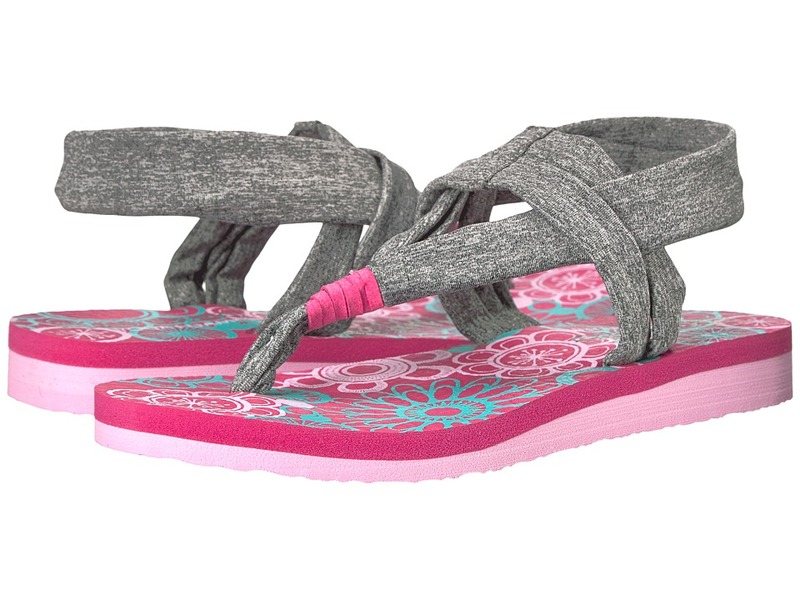 They~re ready for summer with the cool and cute style of the SKECHERS KIDS Meditation sandal! Soft heathered finish jersey knit stretchable fabric upper. Modified casual comfort thong sandal design. Instep slide strap with unconnected ankle sling thong strap. Independent stretch straps for custom comfort. Knotted front accent with fabric toe post. Internal stretch bands for added elasticity. Yoga Foam cushioned comfort footbed. Lightweight flexible midsole. Flexible traction outsole for durable wear. Imported. Measurements: Heel Height: 3 4 in Weight: 4 oz Platform Height: 1 2 in Product measurements were taken using size 2 Little Kid, width M. Please note that measurements may vary by size. Weight of footwear is based on a single item, not a pair. It~s party time in the Energy 10771L Lights! Mid-top silhouette. Sneakers in a smooth manmade upper. Features rechargeable battery with dual-charging USB cable. Start button at tongue for multi color and sequence changing fun. Textured toe bumper front. Lace-up closure for snug fit. Padded collar and tongue for optimal comfort. Smooth fabric lining with cushioned comfort insole. Shock absorbing midsole. Imported. Measurements: Weight: 11 oz Shaft: 4 in Product measurements were taken using size 2 Little Kid, width M. Please note that measurements may vary by size. Weight of footwear is based on a single item, not a pair. Sparkle with a heart of gold! Lights up with every step. 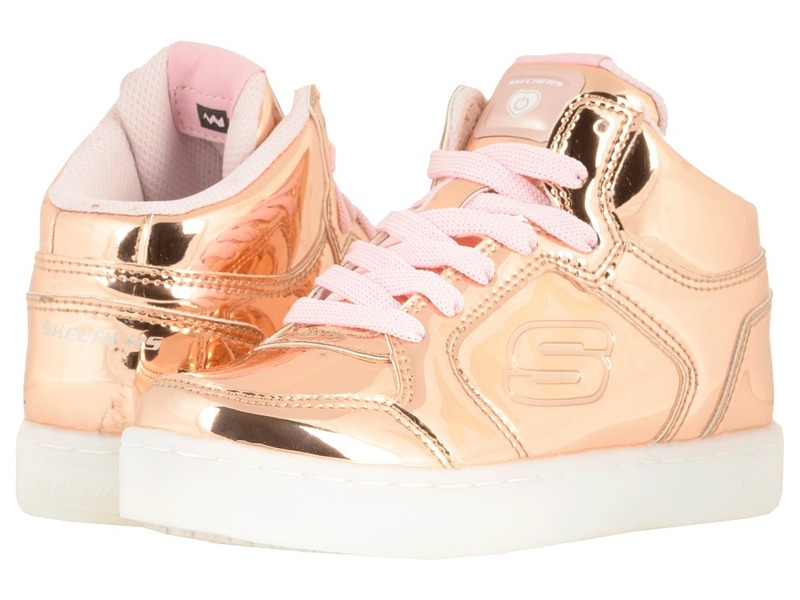 Textile and synthetic upper features allover heart print, glitter details, and studded toe cap. Textured toe bumper. Triple hook-and-loop closures for easy on an and off. Lightly padded collar. Soft fabric lining and a cushioned insole. Light-up sequin-covered toe cap. Vulcanized, shock-absorbing midsole. Flexible traction outsole. Imported. Measurements: Weight: 6.8 oz Product measurements were taken using size 12.5 Little Kid, width M. Please note that measurements may vary by size. Weight of footwear is based on a single item, not a pair. 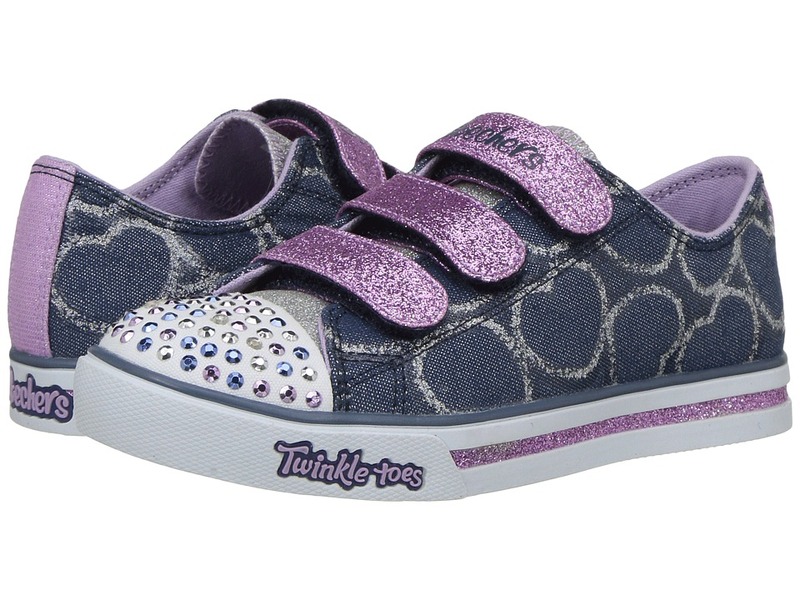 Walk, run, and dance the day away with the Twinkle Toes - Shuffles 10812L Lights sneaker! Lights up with every step. Soft canvas fabric upper with synthetic glitter underlay, glitter details, and studded toe cap. On and off switch at top controls lights. Lightly padded collar for casual comfort. Lace-up closure and hook-and-loop closure strap for a snug fit. Soft fabric lining and a cushioned insole. Light-up sequin-covered toe cap. Vulcanized rubber midsole. Flexible traction outsole. Imported. Weight of footwear is based on a single item, not a pair.